Recently we bought – The Complete Bourne series – (movies) from Amazon. We love both the book and the film series and we watched the films for many times. Here are our reviews for the product we bought and the first movie in the series. The packaging is slick and the DVD are reached to us in real good condition. The order was processed and delivered on time and we are happy overall with the product. The only thing unsatisfactory is continuity of the dubbing track (it jumps from one to the other automatically). The third movie in the package have some different problem, which we will mention when reviewing the same. Let us take a look at the content and aspects of the first film the series – The Bourne Identity. It is worth to note that if – Stephen Bourne – is famous for his contribution in Linux (bsh and bash – shells are named after him); Jason Bourne is also very famous character created by Robert Ludlum. It got so much popular that even after the death of Robert Ludlum, the book series is continued. The Bourne Identity – is the first book in the serries. In 1988 there was a Television Movie made by Roger Young (director) which was inspired by this book. The book was again adapted into a movie with the same name in 2002. Directed by Doug Liman the movie starred Matt Demon as the protagonist. Doug himself was reading Robert Ludlum’s Bourne series books since he was in high school and is a big fan of the books. Before Matt was finalized for the lead role, Russel Crowe and Sylvester Stallone were approached for the role of Jason Bourne. Matt never have played such a physical demanding role ever and to get ready for the film he underwent very extensive training for three months. He did it with so much sincerity that he ended up doing most of the stunts in the film himself! Kudos to his efforts. Apart from him, almost all the actors did first rate job for their respective roles. Be it the actor playing Wambossi or the Govt. officials or others. Matt played his role with the sincerity and so does most of the other actors. For example the actor playing the role of the Italian fisherman, who saves Jason’s life, acts pretty well. His body language is authentic and you never feel that he acts. The movie is also good at pace. It is speedy and doesn’t loose grip in between. Doug was so fascinated for his job that he did a lot of cameraman job himself. He wanted to be as close as possible with the content of the movie by all the means. Simply watching it on the monitor was not enough for him. His passion resulted into good movie of course. Of course there are lot of differences in the book and the movie. Whatever we see in the first half hour of the movie, takes a lot of pages in the book. Also the character of Marie is very different in the book than it is represented in the movie. Though, the scope of the book and the movie are quite different and hence such changes are often necessary. The changed doesn’t work against the movie, as the matter of fact. People talk a lot about the car chase sequence (which is fantastic of course) and other sequences. 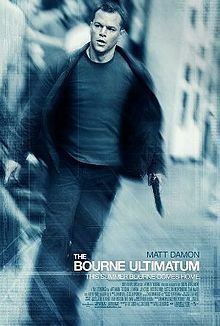 However the sequence where Matt escapes from the US embassy building bare-handed is must to mention. It is definitely one of the tough sequence to do. The freezing environment, the sleepy (due to ice) walls of the building and bare-hands make the task very difficult. Of course, the sequence doesn’t seem to be filmed in a single shot, but then also, it is tough. Also the hand to hand combat sequence in Paris where Jason overpowers the agent who came to kill him, is also worth a mention. The movie have a lot of work for action director and most of the work is done with real actions rather than SFX. Action is definitely the positive aspect of the film. It doesn’t fail on the emotional quotient as well. You will be able to draw links with some situations and stuff related to James Bond movies (and books) at various places. The background music is first rate. The up-downs of the background score are fantastic. The loud start of action sequence background score from all silence is very effective. The director knows his job and we clearly see it. The dialogs are simple, small and effective. Overall the movie works at most of the aspects and it is definitely good choice for thriller lovers. And yes, the picture and sound quality of the DVD is simply nice.